You’re getting ready to make some updates to your home, and that includes giving your bathroom a fresh, clean look. If it’s been a while since you’ve updated your bathroom, you may have your work cut out for you to update everything and ensure that all the plumbing is still in good working order. Before you get started, you should assess what you want to spend on your project and what the cost of the remodel will be. To do that, there are several factors to take into consideration when determining the cost. The types of materials you use will play a part in determining the overall cost. Obviously, the cheaper your materials are, the cheaper your remodel will be. Just remember that cheaper isn’t always better. Sometimes when you sacrifice cost on materials to save a little money, your finished product may not be as high quality and won’t last as long, which can result in you needing to make further renovations in the near future that you weren’t planning on. Deciding who will do the work can have a large factor on overall cost. If you want to save a little money and you’re fairly handy, you could complete much of the work yourself. However, if you don’t have the time, skills, or confidence to complete the work on your own or your bathroom needs major plumbing upgrades in addition to surface upgrades, then you should seriously consider a professional for your bathroom remodeling project. 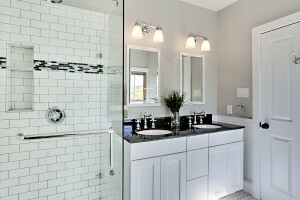 The overall square footage of your bathroom also plays a factor in the overall cost of your project. If you have a small bathroom with no shower, for example, your costs to remodel should be minimal. If, however, you have a sprawling bathroom suite with a shower, tub, dual sink, and toilet, you’re looking at spending much more to complete the project. Bathroom costs can vary greatly depending on these factors. You can do your bathroom remodel for as much or as little money as you want as long as you keep these items in mind.